First saw this on Alvinology, hope he doesn’t mind that I borrowed his photograph. Anyway, I thought it was important to share this with anyone who might stumble upon my blog. 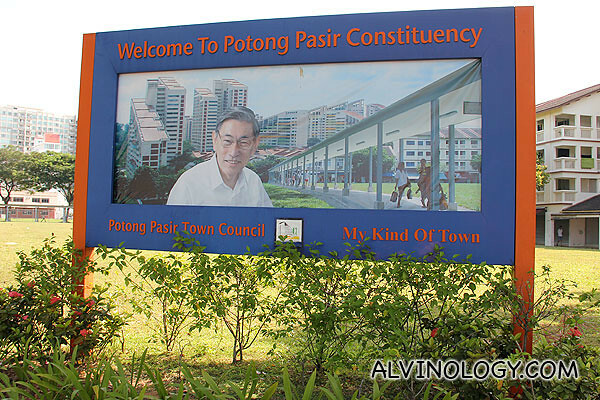 Do take your photo with the Welcome to Potong Pasir Constituency Signboard featuring Mr Chiam See Tong. This signboard will probably be torn down by the new MP Elect Mr Sitoh Yih Pin, now that Mr Chiam See Tong is no longer the MP of Potong Pasir. Even though I have never lived in Potong Pasir, I can feel the sadness on the ground that Mr Chiam will no longer be an MP. It seems he has done much for the country in his 27 years in politics. All the best to him in his retirement. He deserves to enjoy life now. For the exact location, as well as a more detailed post of Potong Pasir, do visit the Alvinology website. So sad to see this board come down….but what a great man!! Yes indeed! I’ve been reading all the comments in the forums lately. Seems like Mr Chiam See Tong has done so much for Singapore. Everyone respects him!